Disclaimer: The views and guidelines in this article are not intended to be taken literally nor do they reflect the practices and views of Rinse and our cleaning partners. They are solely intended for entertainment and are not recommended by Rinse to be carried out. Throughout December it has been clear we spent a lot of time focused on socks. In the spirit of being light-hearted, we thought we’d wind down the month with a fun take on cleaning socks! Socks are arguably the most important piece of your daily outfit. Everyone sees them. They produce a welcoming aroma. They protect the most beautiful part of your body, feet. It is imperative to take extra special care of socks! Here’s how. It is recommended to wash your socks by hand. You will be able to give them the special attention and care they deserve, and it is an excellent use of your spare time. Be sure to use a freshly cleaned sink filled with warm water. It is also recommended to clean the sink prior to use by wiping it down with other clothes as this creates additional laundry for you to care for after you finish cleaning your socks. All laundry should be treated and cared for equally! Remove surface dirt by using a toothbrush. Toothbrushes are not only good at removing plaque off of your teeth, but they are also useful when attempting to remove dirt off of your socks prior to soaking them in water. Pro Tip: electric toothbrushes speed up this process and enable you to clean more socks at a faster rate! Be sure to physically submerge each of your socks in water for at least two minutes. This will ensure the socks are thoroughly cleaned and you will receive wrinkly bath fingers. If you don’t receive wrinkly fingers you are not caring for your socks properly. Use a blow dryer to dry each sock. Pro Tip: place your hand inside the sock as if you were using it as a puppet. This serves dual purposes. It allows you to properly dry the sock and you may stumble upon an impromptu puppet show. Well, that was fun! While it may sound like those are great tips we cannot omit the fact that these tips are for entertainment. 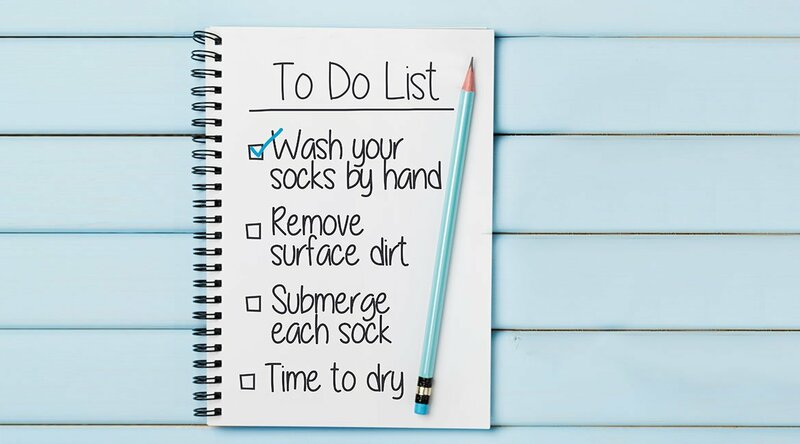 When in doubt schedule a Rinse and we’ll provide the best care for your socks and the rest of your items! Happy Holidays and Happy Rinsing!